Carsen Wetzel writes letters to community leaders, UW-Superior administration and UW System in opposition to the suspension of 25 programs on campus. Protests, teach-ins and rallies have been held on the University of Wisconsin-Superior campus since university officials made the announcement on Halloween that it would suspend 25 programs. UW-Superior leaders say the move wasn’t driven by budget cuts. Instead, they say they're trying to eliminate poor-performing majors and minors, and that administration is responding, in part, to the state's plan to tie new UW System funding to how institutions perform on things such as student access and success. Faculty, students and alumni have expressed outrage over the program suspensions, which they say was made with little or no input from those affected. 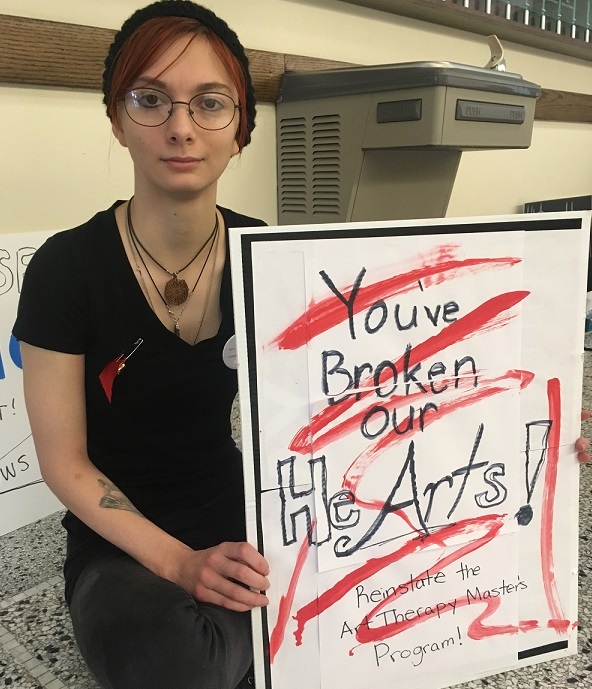 Since the announcement, student Carsen Wetzel has held the same sign at several events on campus, the sign reads "You’ve broken our HeARTS." The UW-Superior junior has been working toward a bachelor's degree in art therapy and planned to pursue her master’s degree in the same program at the university. But, the graduate program is one of the 25 being suspended. "I might not be able to pursue my dream, because to receive certification to become an art therapist you are required by the American Art Therapy program to obtain a master’s program or a master’s degree," she said. "This was my only shot because UW-Superior is the only public university in the entire United States that has both an undergrad and a master’s degree. Anywhere else is private and extremely expensive or far away." Suspended programs have a five-year window in which they could be restored if prospective students showed substantial interest in those programs, the university has said. The 25 programs include nine majors, 15 minors and the arts therapy graduate program. Students enrolled in the affected majors and minors will be able to complete their degree. UW-Superior suspended 20 programs several years ago to save money and address a $4.5 million budget shortfall. This time, campus leaders said they’re eliminating some due to low enrollment, the number of credits it takes students to reach their degree and poor graduation rates. UW-Superior interim Provost Jackie Weissenburger said their decision isn't directly linked to funding. "However, several on the suspension list are those programs that students are taking a long time to complete their degree," she said. "They’re averaging well over 138 credits before they finish, and that is one of the performance metrics that I’m fairly confident we are going to be gauged on and would be potentially tied to funding." The minimum number of credits for a bachelor's degree is 120 credits at UW-Superior, while the national average for students is 135 credits before they reach their degree. UW-Superior students are averaging 138 credits before graduation. Since 1993, the system has held universities accountable for their performance. In recent years, lawmakers have demanded more accountability from the system through development of performance measures, including financial management and educational performance. The 2017-19 state budget awarded UW System $36 million in new funding over the biennium, much of which will be tied to performance. UW System President Ray Cross was not available for comment, but he said earlier this year in testimony before the Assembly Committee on Colleges and Universities that he envisioned institutions being allowed to choose how they measure their performance much like the Wisconsin Technical College System. "Some would be improvement metrics, some would be excellence or maintenance metrics," he said. "That would respect the unique missions of each institution, but all must contribute to the system-wide metrics and improvement for statewide issues." However, Gov. Scott Walker disagreed and used his veto authority to remove the ability of institutions to choose their own performance metrics under the two-year budget. "Allowing institutions to choose the metrics upon which to be measured is likely to result in funding allocations based upon metrics that are easiest for institutions to improve upon or maintain," said Walker in his veto message. "This partial veto deletes the ability of institutions to choose performance funding metrics, which will ensure funding incentivizes institutions to improve and excel in many areas." Gov. Walker's proposed budget included a set of 18 performance metrics, including length of time to obtain a degree and graduation rates. Now, it will be up to the UW Board of Regents to design a formula that will gauge performance on student success, graduation rates, efficiency and workforce needs. Those performance metrics are being developed under the guidelines of the most recently passed budget, said UW System spokeswoman Stephanie Marquis. "We expect to present recommended metrics to the Board of Regents for review in December, prior to submitting it to the Joint Finance Committee by the Feb. 15, 2018, deadline," Marquis wrote in an email. UW-Superior Chancellor Renee Wachter said the fact that new funding will be tied to performance creates a greater sense of urgency for the university. "The longer action gets delayed, the harder it is to make those numbers move in a timely manner to be able to access funding or access support," she said. Researchers disagree on whether performance-based funding ultimately benefits schools like UW-Superior and their students. David Tandberg, policy analyst with the State Higher Education Executive Officers Association, has examined the differences in student completion rates among states that do and don't tie funding to performance. "We generally found that there wasn’t a statistically significant increase in completions, although in a few instances where performance funding existed for five to seven years or longer we would see some small increases in completion," he said. Other researchers argue evidence suggests performance funding can focus policies to improve student success, including Kate Callahan, quantitative research director with the nonprofit education research organization Research for Action. However, she said formulas that weigh heavily on the success of students completing their degrees could encourage schools to avoid enrolling low-income or under-represented students that often take longer to finish. "The institutions that are already open access and are serving these students that take a longer time to degree are realizing that they have to put in a lot of resources and supports for these students to get them out the door sooner," she said. "So, it’s an extra burden on those institutions and can’t just be accomplished through some tweaks." As Wisconsin starts developing its own performance funding formula, Callahan said it's important to recognize that some campuses serve students who need more support and provide those resources. "If they don’t, then I think what we do see is that these policies can have negative impacts on specific institutions or more vulnerable students," she said. A spokesman with Gov. Walker's office said he's confident the Board of Regents can develop a formula that meets the diverse needs of institutions. "When it comes to sufficient resources, the UW System has an annual budget of more than $6 billion and an annual GPR block grant worth more than $1 billion over which the Board of Regents has broad discretion," wrote spokesman Tom Evenson in an email. UW-Superior has said 46 percent of its nearly 2,600 students are first-generation college students, many of whom struggle to pay for school, like Carsen Wetzel. She said she has to consider dropping out now that the university has suspended the master’s art therapy program. "It’s essentially a useless degree until I can get my master’s program. (I’ll) wait a couple years, maybe save up some money and maybe attempt to go somewhere else, but the likelihood of that is very slim," she said of going someplace else. Wetzel doesn’t know if she could afford the move or starting over with another major.